This nineteenth century representation of Freyr depicts him with his two most valued possessions: his boar and his sword. Freyr (sometimes anglicized Frey) was one of the most important deities in Norse mythology. He was said to rule over the sun and rain, be the giver of life in the fields, and the bestower of "peace and pleasure on mortals"
Freyr was also one of the esteemed Vanir (a race of Norse gods) and was worshipped as a phallic fertility god. He was easily recognized in mythic representations by the presence of his enchanted blade, his war-boar and his ship (see picture inset). Finally, he was especially associated with Sweden and was seen as an ancestor of the Swedish royal house. As a Norse deity, Freyr belonged to a complex religious, mythological and cosmological belief system shared by the Scandinavian and Germanic peoples. This mythological tradition, of which the Scandinavian (and particularly Icelandic) sub-groups are best preserved, developed in the period from the first manifestations of religious and material culture in approximately 1000 B.C.E. until the Christianization of the area, a process that occurred primarily from 900-1200 C.E.. The tales recorded within this mythological corpus tend to exemplify a unified cultural focus on physical prowess and military might. As a god of fertility and sexuality, Freyr was one of the most widely revered Norse gods. Freyr was of part of a group of gods (the Vanir) who were responsible for trade, fertility, wealth, and sexuality. In particular, he is associated with three magical artifacts: an intelligent sword that never misses its target, a golden boar, and a fantastic ship (all of them dwarf-made). The ship, Skíðblaðnir, is said to always have a favorable breeze and it can be folded together like a napkin and carried in a pouch. However, the ship is not heavily featured in any surviving myths. The boar, on the other hand, called "Gullinbursti," whose mane glows to illuminate the way for his owner, remained popular in Norse myths and was said to be used by Freyr to attend Balder's funeral. Finally, his sword is eventually given to Skirnir (his page), which indirectly leads to the god's death at Ragnarök (the great battle at the end of time) (see below). 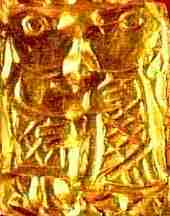 Several Scandinavian gold plaques have been interpreted as showing a meeting between Freyr and Gerðr. Njördr in Nóatún begot afterward two children: the son was called Freyr, and the daughter Freyja; they were fair of face and mighty. Freyr is the most renowned of the aesir; he rules over the rain and the shining of the sun, and therewithal the fruit of the earth; and it is good to call on him for fruitful seasons and peace. He governs also the prosperity of men. and from bonds looses all. This association suggests a now-lost connection between the Vanir and the Elves. It chanced one day that Freyr had gone to Hlidskjálf, and gazed over all the world; but when he looked over into the northern region, he saw on an estate a house great and fair. And toward this house went a woman; when she raised her hands and opened the door before her, brightness gleamed from her hands, both over sky and sea, and all the worlds were illumined of her. The woman was Gerðr, a beautiful Jotun (giantess). Freyr immediately fell in love with her and became depressed, feeling that he would die if he could not be united with his beloved. After a period of fruitless brooding, he finally drevealed his romantic woes to Skírnir, his foot-page. After bemoaning his broken-hearted state, the god entreated his servant to go forth and woo the giantess in his stead. Skirnir agreed, but noted that he would require his master's horse and sword to brave the dangers between their home and the giantess's abode. Then Skírnir answered thus: he would go on his errand, but Freyr should give him his own sword-which is so good that it fights of itself;- and Freyr did not refuse, but gave him the sword. Then Skírnir went forth and wooed the woman for him, and received her promise; and nine nights later she was to come to the place called Barrey, and then go to the bridal with Freyr. The Eddic poem Skírnismál provides further insight into the means of persuasion employed by Skirnir to encourage the giantess to return with him to his master. When she refused his gifts and entreaties, Freyr began to threaten her with magical curses until she relented and agreed to the marriage. The loss of Freyr's sword was not without consequences. For instance, a later account describes a battle between Freyr and Beli (a giant), who the weaponless god ended up slaying with an antler. More significantly, the loss of his sword is said to be one of the reasons that Freyr falls to Surtr at Ragnarök (the battle at the end of time). During the eschaton, Freyr, defending Asgard against the host of fire giants attacking from the south, will be killed by Surtr (the fire giant who rules over Muspelheim). His death is described in Völuspá, the best known of the Eddic poems. More concisely, the Prose Edda states that "Freyr shall contend with Surtr, and a hard encounter shall there be between them before Freyr falls: it is to be his death that he lacks that good sword of his, which he gave to Skirnir." Thus, the god's loss is credited to the fact that he gave his magical sword to his servant. 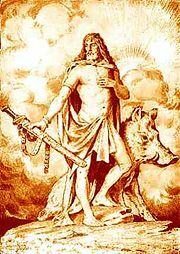 While many of the gods in the Norse pantheon were seen to have an active relationship with human individuals and societies (often as bestowers of favors), Freyr is somewhat unique for his relationship with the Swedish royal family. This euhemeristic attribution is evidenced in numerous sources, including the Íslendingabók, the Danish History of Saxo Grammaticus, and Snorri Sturluson's Ynglinga Saga. In a more detailed manner, Snorri Sturluson begins his epic history of Scandinavia with the Ynglinga saga, a euhemerized account of the Norse gods. Here, Odin and the Æsir are depicted as men from Asia who gain power through Odin's leadership skills and the clan's considerable prowess in war. These advantages were sorely tested when the All-Father declared war on the Vanir, as he underestimated the rival tribe's bravery and ferocity. This tactical misstep led to a costly and indecisive war, which was eventually concluded with a truce and sealed with the exchange of hostages. Two of the Vanir's hostages were Freyr and Njörðr, who were thereby sent to live with the Æsir. There were good seasons, in all the land, which the Swedes ascribed to Frey, so that he was more worshipped than the other gods, as the people became much richer in his days by reason of the peace and good seasons. … Frey was called by another name, Yngve; and this name Yngve was considered long after in his race as a name of honour, so that his descendants have since been called Ynglinger. Frey fell into a sickness; and as his illness took the upper hand, his men took the plan of letting few approach him. In the meantime they raised a great mound, in which they placed a door with three holes in it. Now when Frey died they bore him secretly into the mound, but told the Swedes he was alive; and they kept watch over him for three years. They brought all the taxes into the mound, and through the one hole they put in the gold, through the other the silver, and through the third the copper money that was paid. Peace and good seasons continued. 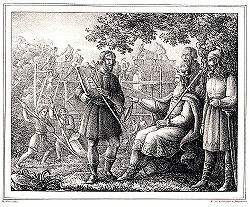 When it became known to the Swedes that Frey was dead, and yet peace and good seasons continued, they believed that it must be so as long as Frey remained in Sweden; and therefore they would not burn his remains, but called him the god of this world, and afterwards offered continually blood-sacrifices to him, principally for peace and good seasons. Ynglinga saga 13,  Laing's translation. In this mythico-religious account, Freyr had a son named Fjölnir, who succeeded him as king and ruled during the continuing period of peace and good seasons following his father's death. Fjölnir's descendants are enumerated in Ynglingatal, which describes the lineage of Sweden's mythological kings. Great heathen sacrifices were held [in Sweden] at that time, and for a long while Frey had been the god who was worshipped most there—and so much power had been gained by Frey’s statue that the devil used to speak to people out of the mouth of the idol, and a young and beautiful woman had been obtained to serve Frey. It was the faith of the local people that Frey was alive, as seemed to some extent to be the case, and they thought he would need to have a sexual relationship with his wife; along with Frey she was to have complete control over the temple settlement and all that belonged to it. In this particular account, the cult assumes a sexual dimension, which would certainly be in keeping with Freyr's status as a fertility god. The reference to the change in sacrificial ritual may also reflect some historical memory. There is archaeological evidence for an increase in human sacrifice in the late Viking Age, though among the Norse gods this practice was more often linked to the worship of Odin. [I]n order to mollify the divinities he did indeed make a holy sacrifice of dark-coloured victims to the god Frø. He repeated this mode of propitiation at an annual festival and left it to be imitated by his descendants. The Swedes call it Frøblot. 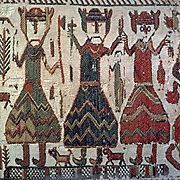 This twelfth century Swedish tapestry possibly depicts the one-eyed Odin, the hammer-wielding Thor, and Freyr holding up grain. Alternatively, these fugures may represent St. Olaf, Saint Canute and Saint Erik. As was often the case in medieval Christianity, the conversion of the Nordic countries did not dispel the existing worship of Freyr that characterized the religious life of the region. Instead, it led to the popular veneration of saints with a less-than-coincidental similarity (in terms of iconography, ritual practices, or area(s) of patronage) to the Norse deity. Indeed, several saints within European Catholicism have domains and rites similar to those of Freyr. In some areas of Western-Europe, Saint Blaise was honored as the patron saint of plowmen and farmers. The benediction of grain prior to seeding was associated with him and on Saint Blaise's Day (February 3), a procession was held in his honor. In the procession, a man representing the saint was drawn on a cart throughout the countryside - a parallel to the mythic Freyr's cart (which was likely used in his cult). In some villages, Saint Blaise was also considered a patron of human fecundity and young women wishing to marry prayed before his statue. In Scandinavia and England, Saint Stephen may have also inherited some of Freyr's legacy. His feast day is December 26, which caused him to play a part in the Yuletide celebrations which were previously associated with Freyr. In old Swedish art, Stephen is shown as tending to horses and bringing a boar's head to a Yuletide banquet. Both elements are extra-canonical and may be pagan survivals. Christmas ham is an old tradition in Sweden and may have originated as a Yuletide boar sacrifice to Freyr. Another saint with a possible connection to Freyr is the twelfth century Swedish King Eric IX, who also came to be associated with fertility. The farmers prayed to Saint Eric for fruitful seasons and peace and, if there was a year of bad harvest, they offered a grain ear of silver to him or gave horses to the church (a more sanitary version of the horse sacrifice performed in the name of the Norse deity). At May 18, his feast day, the relics of Saint Eric were drawn in a cart from Uppsala to Gamla Uppsala. ↑ The name Freyr is believed to be cognate to Gothic frauja and Old English frēa, meaning lord. It is sometimes anglicized to Frey by omitting the nominative ending, or to Fricco. In the modern Scandinavian languages it can appear as Frej, Frö, Frøy or Fröj. In Richard Wagner's Das Rheingold the god appears as Froh. ↑ Adam of Bremen. (eleventh century German historian) Gesta Hammaburgensis 26, Tschan's translation. ↑ In fact, Freyr was the primary deity in Swedish paganism. Thomas A. DuBois.(1999). Nordic Religions in the Viking Age. (Philadelphia: University of Pennsylvania Press), 58. ↑ More specifically, Georges Dumézil, one of the foremost authorities on the Norse tradition and a noted comparitivist, argues quite persuasively that the Aesir / Vanir distinction is a component of a larger triadic division (between ruler gods, warrior gods, and gods of agriculture and commerce) that is echoed among the Indo-European cosmologies (from Vedic India, through Rome and into the Germanic North). Further, he notes that this distinction conforms to patterns of social organization found in all of these societies. See Georges Dumézil's Gods of the Ancient Northmen (especially xi-xiii, 3-25) for more details. ↑ "Húsdrápa," quoted in Snorri Sturluson's Prose Edda (VII). . Brodeur's translation. ↑ Gylfaginning XXIV, Brodeur's translation. ↑ John Lindow. Handbook of Norse mythology. (Santa Barbara: ABC-Clio, 2001), 121. ↑ Lokasenna 37, Thorpe's translation. ↑ Grímnismál 5, Thorpe's translation. ↑ (Gylfaginning XXXVII, Brodeur's translation). ↑ Skírnismál 26-28, Hollander's translation. ↑ Andy Orchard. Cassell's Dictionary of Norse Myth and Legend. (London: Cassell, 2002), 118. ↑ Völuspá 50 - 51, Dronke's translation. ↑ Gylfafinning, LI. Brodeur's translation, 79. ↑ Yngvi is a general term translatable as "king," which is considered by some (especially Snorri Sturluson) to be an alternate name for Freyr. Archaeologically, the name seems related to Yngvi, Ingui or Ing (and thus to the Proto-Germanic deity *Ingwaz). Lindow, 200-201, 326. ↑ Ynglinga saga, 12, Laing's translation. ↑ Some of the tales, poems and sagas mentioning Freyr's cult include Hrafnkels saga, Gísla saga, Hallfreðar saga, Víga-Glúms saga, Vatnsdœla saga, Íslendingabók, Landnámabók and Hervarar saga. ↑ Gesta Hammaburgensis 26, Tschan's translation. It should be noted that historians are divided on the reliability of Adam's account, a debate that is described in Ulla Haastrup, R. E. Greenwood and Søren Kaspersen (eds.) (2004). Images of Cult and Devotion: Function and Reception of Christian Images of Medieval and Post-Medieval Europe. (Copenhagen: Museum Tusculanum Press), 18-24. ↑ McKinnell's translation of the text, quoted in Anne Heinrich. "The Search for Identity: A Problem after the Conversion" in Alvíssmál, Volume 3 (1994), 54-55. [Accessed online. ↑ Gesta Danorum, 3, Fisher's translation. ↑ Hilda Ellis Davidson and Peter Fisher. (1999). Saxo Grammaticus: The History of the Danes: Books I-IX. (Bury St Edmunds, UK: St Edmundsbury Press, 1999, Vol. II), 55. ↑ Gesta Danorum, 1, Fisher's translation. ↑ See W. Burkert. Greek Religion, Trans. by J. Raffan. (Cambridge, MA: Harvard University Press, 1985) - especially section IV: "The Dead, Heroes and Chthonic Gods," 190-214. ↑ Terje I. Leiren. (1999). From Pagan to Christian: The Story in the 12th-Century Tapestry of the Skog Church. ↑ See, for example, Timothy E. Gregory. "The Survival of Paganism in Christian Greece: A Critical Essay." The American Journal of Philology 107 (2) (Summer, 1986): 229-242, for a number of instances of this type of "pagan survival." ↑ Pamela Berger. The Goddess Obscured: Transformation of the Grain Protectress from Goddess to Saint. (Boston: Beacon Press, 1985), 81-84. ↑ Bengt Thordeman (ed.) Erik den helige: historia, kult, reliker. (Stockholm: Nordisk rotogravyr, 1954). Bellows, Henry Adams (tr.) (1936). "Völuspá" in The Poetic Edda. Princeton: Princeton University Press. Accessed online at sacred-texts.com. Berger, Pamela (1985). The Goddess Obscured: Transformation of the Grain Protectress from Goddess to Saint. Boston: Beacon Press. ISBN 0807067237. Burkert, W., (1985). Greek Religion, Trans. by Raffan, J., Cambridge, MA: Harvard University Press, ISBN 0674362810. Davidson, Hilda Ellis and Peter Fisher (1999). Saxo Grammaticus: The History of the Danes : Books I-IX. Bury St Edmunds: St Edmundsbury Press. ISBN 0859915026. First published 1979-1980. DuBois, Thomas A. (1999). Nordic Religions in the Viking Age. Philadelphia: University of Pennsylvania Press. ISBN 0812217144. Dumézil, Georges (1973). From Myth to Fiction : The Saga of Hadingus, Trans. Derek Coltman. Chicago: U. of Chicago Press. ISBN 0226169723. Dumézil, Georges. (1973). Gods of the Ancient Northmen, Edited by Einar Haugen; Introduction by C. Scott Littleton and Udo Strutynski. Berkeley: University of California Press. ISBN 0520020448. Grammaticus, Saxo (1905). The Danish History (Volumes I-IX). Translated by Oliver Elton (Norroena Society, New York). Accessed online at The Online Medieval & Classical Library. Gregory, Timothy E. "The Survival of Paganism in Christian Greece: A Critical Essay." The American Journal of Philology 107 (2) (Summer, 1986): 229-242. Hollander, Lee M. (tr.) (1962). The Poetic Edda: Translated with an Introduction and Explanatory Notes, 2nd ed., rev. Austin, TX: University of Texas Press. ISBN 0292764995. (Some of the translations appear at Wodensharrow: Texts). Lindow, John (2001). Handbook of Norse mythology. Santa Barbara: ABC-Clio. ISBN 1576072177. Orchard, Andy (2002). Cassell's Dictionary of Norse Myth and Legend. London: Cassell; New York: Distributed in the United States by Sterling Pub. Co. ISBN 0304363855. Turville-Petre, Gabriel (1964). Myth and Religion of the North: The Religion of Ancient Scandinavia. New York: Holt, Rinehart and Winston. This page was last modified on 29 April 2008, at 15:21.